Our experienced operators can assemble multi-part devices and carry out full compliance testing under our ISO 13485 certified quality systems. Work is carried out inside our ISO class 7 cleanrooms where the highest standards of hygiene and control are maintained so you can be sure of a problem-free product every time. 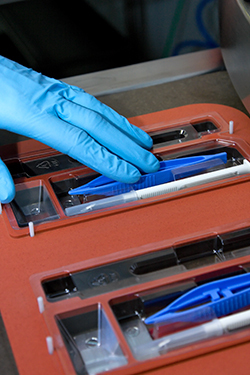 Contract packing means you can outsource the work to where the packaging is produced and receive complete device packs, ready for in-house or external sterilization. Our staff are trained in standard packing procedures which can be adapted to Individual requirements. Contract packing can be done in our ISO class 7 cleanrooms. Services may not be available in all locations, please contact your nearest Nelipak location for confirmation.